I have purposely deleted the contact form on this page due to spamming issues. 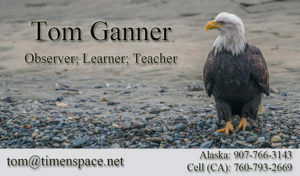 For questions or information, please feel free to contact me by phone or email. I look forward to sharing with you. In case you missed it, and want to know a little more about the gentleman behind the pitch, please enjoy my Bio and Photography Blogs. Great WildlifePhotography in Haines We had to take the Haines-Skagway Fast Ferry to get to Haines from our cruise ship dock in Skagway, and it was worth it. Tom has lived in Haines for many years and is intimately familiar with where the wildlife hangs out and their patterns of behavior. He even knows... read moreWe had to take the Haines-Skagway Fast Ferry to get to Haines from our cruise ship dock in Skagway, and it was worth it. Tom has lived in Haines for many years and is intimately familiar with where the wildlife hangs out and their patterns of behavior. He even knows some of them by name. Over the course of a four hour excursion we were able to photograph numerous bald eagles, both adults and juveniles. I used my 150-600mm zoom lens, but thenTom dragged out his 500mm fixed supertelephoto with his 1.4 extender. The clarity of the images was spectacular. Unfortunately, we had little luck with the brown bears that day. We did see one, but were unable to get any good pictures. Just the luck of the draw.